The Pennsylvania Department of Transportation will soon apply for a federal grant that, if awarded, would fund the construction of a long-planned high-speed interchange between Interstates 80 and 99 at Bellefonte. Local government and business leaders and PennDOT officials discussed the effort on Monday at the Chamber of Business and Industry of Centre County's office in State College. "As is the case with any large-scale transportation project, the process is very long and very challenging," said George McAuley, PennDOT Deputy Secretary for Highway Administration. "The federal government’s involvement is critical in moving forward with such projects as the high-speed interchange for I-99 and I-80." PennDOT will submit an application to the U.S. Department of Transportation's Infrastructure for Rebuilding America (INFRA) grant program, which provides discretionary funding for federal highway and bridge projects. PennDOT selected the interchange as the state's project for application and is seeking $45 million. The total project, which would include the interchange and improvements to Jacksonville Road/Route 26 to link to the interchange, is estimated to cost nearly $200 million. I-99 and I-80 would connect where Jacksonville Road intersects with Route 26 and at the turn from Route 26 to I-80. Route 26 would go under the interchange. The Centre County Metropolitan Planning Organization (CCMPO) in September approved a commitment of about $8 million for the Jacksonville Road work if the federal grant is approved. PennDOT has committed to provide $145 million in spike funding if the INFRA grant is approved. Some of that would be money PennDOT would have to spend on I-80 bridge replacements and safety improvements if the interchange is not constructed. "Our commitment is not a large percentage of the overall project but it is a large fraction of the transportation funding we’re allocated," CCMPO chair and Patton Township supervisor Jeff Luck said. "As a result it’s not an easy lift for us. It’s going to impact other transportation projects. We’re doing it because we think it’s critically important to finish this particular large project. "The current federal administration has asked for more state and local investment in order to move transportation projects forward. This IFNRA grant submission represents that kind of commitment." If funding isn't approved and the interchange isn't constructed, bridge replacements and safety improvements will need to be completed at a cost of more than $40 million. Should that happen, Luck said it likely will be a generation before a high-speed interchange would be considered again. "Once those investments are made and safety improvements are made, certainly PennDOT and the taxpayers aren’t going to want to go back and rip that out in order to put in the full interchange," Luck said. "So we’re really hopeful that this is going to move forward." Safety issues have been the primary concern for CCMPO. Luck likened the need for a new interchange with the recent road widening and bridge replacement at Waddle Road in Patton Township, where traffic off of I-99 could get backed up onto the highway's right lane. I-80 exit 161 at Bellefonte sees similar back ups on busy days, and several major accidents have occurred in the area in recent years. The INFRA grant application is due at PennDOT's central office for review on Thursday. McAuley said it's unknown how long it will be for the federal officials to make a decision on the grants, which are highly competitive. INFRA grant projects are required to go to construction within 18 months of being awarded. Because the interchange had been planned for but not funded when the I-99 corridor was completed, some of the work is already done. PennDOT expects it would take about a year for permitting and bidding, and the construction would take about two years. In support of the funding efforts, CBICC recently launched “Drive Forward,” a campaign to garner support for the project. Penn State, private businesses and community members are among those supporting the campaign. The Drive Forward website went live on Monday and community members and businesses can submit their names as supporters. CBICC President and CEO Vern Squier said information on community support needs to be submitted to PennDOT to be included with the grant application. CBICC and others are submitting letters in support of the application, stressing the project's importance for safety and economic development. 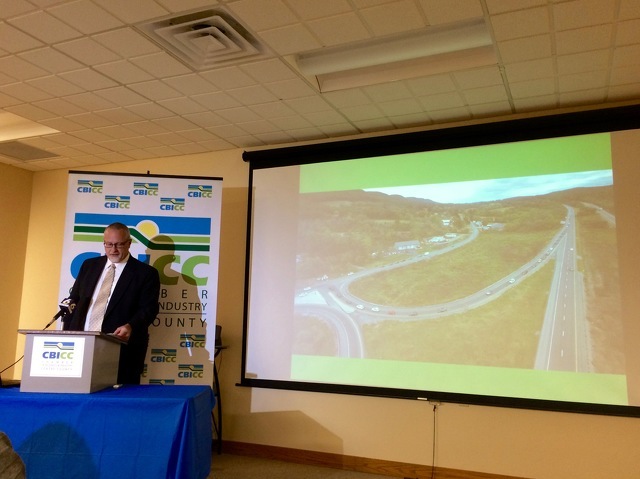 Squier said that even residents who don't often travel there are impacted by the I-80 exit at Bellefonte as a critical artery for delivering goods and services to Centre County. "It’s very important we have safe, efficient and effective transportation pathways," Squier said. "What I’ve discovered is there is no one exempt from caring about this issue. Even if you don’t personally travel these routes at all or very frequently, the products that come to you, the ambulance that’s going to come pick you up or deliver the blood plasma to the hospital that you need… There are myriad examples that can be given of how that pathway if it’s interrupted, it’s a problem." The Drive Forward campaign is advocating for the high-speed interchange as well as another long-gestating highway project -- improvements to the stretch of U.S. Route 322 from Potters Mills to Boalsburg. 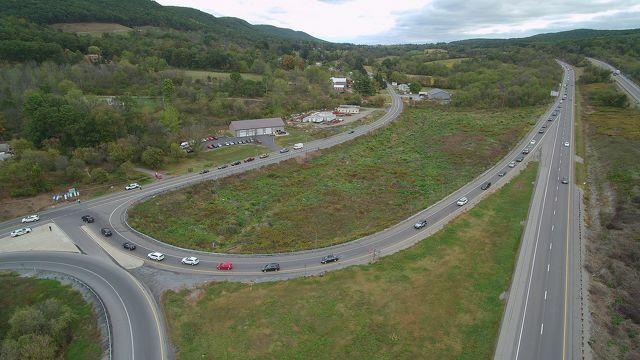 Route 322 has been undergoing a three phase Potters Mills Gap project, with the current phase for the Sand Mountain Road interchange to wrap up by the end of the year and the third phase, a new Route 144 interchange, planned to begin in the spring. A replacement of the final stretch of 322 from Potters Mills to Boalsburg has long been considered, but to date has no funding. A study for improvements to that stretch was stopped in 2004 because of a lack of funding. The data for that study is now being refreshed, but there is no money for design or construction. "It is another project that this initiative is going to attempt to get moving forward over time," Luck said. "That project has a very long timeline associated with it and what we’re hoping to do is pick up incremental funding over a period of time to do the various steps." The 322 project will be "very expensive" by the time it gets to construction, Luck said, and "will have to be funded through some type of extraordinary spike funding in order to get it complete." Engineering for the I-80/I-99 interchange is much further along than the 322 project, Luck said. Squier added that both projects are important to the region, and that the interstate interchange can be completed more quickly. "We want to let everybody know this is a project that’s a great commitment over time," Squier said. "The durability of this is years and it's the faster of the two projects. The more we can keep this in alignment and support each other is great. Getting these issues addressed is part of advancing our economy going forward." McAuley, meanwhile, said the INFRA grant isn't a sure thing, and that there is uncertainty with how the federal government will approach infrastructure investment, but that planners remain hopeful. "Faced with fiscal realities we can’t make promises on timetables," he said. "Our best hope is for recognition in Washington that supporting significant infrastructure investments like this is a wise course of action and one they can support." I-80 Exit 161 at Bellefonte as it is currently constructed, along with the entrance to I-80 on-ramps from Route 26, are frequently the site of traffic backups. Officials hope to secure federal funding for a new high-speed interchange between I-80 and I-99. 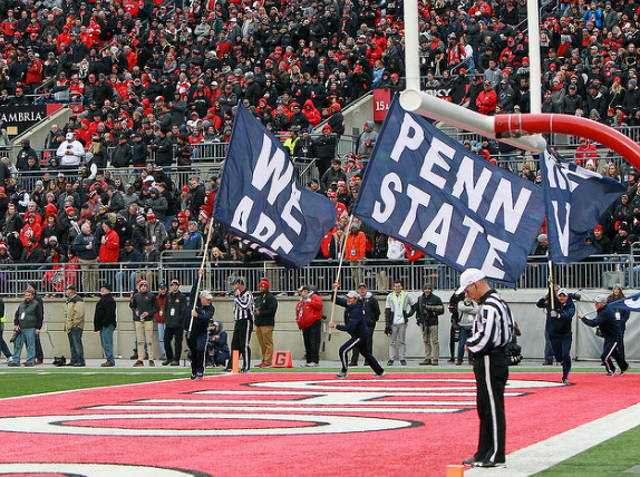 It might be easy to forget, but Penn State's season is not in fact over, and the Nittany Lions are still in the playoff conversation heading into the final third of the year.